These are the 17+ things that really helped me get going with woodworking. Hope it helps you as much as they did me. 1) If you are using Firefox browser, get a free add on YouTube download helper app. Search for videos on all aspects of woodworking that interest you and collect them. I watch a video on the topic of whatever project, or phase of a project, on which I’m currently working. VERY helpful to see it done a few times before you try it yourself. My downloader puts a download button under the video on YouTube. Click the button, name the file (I always label it according to the tool or job it works on. For example, anything to do with routing, I label as “Router”, which clusters all the similar videos together in Windows Explorer. All my videos go into a single folder. I sometimes watch woodworking video while on planes, which triggers some interesting conversations. 2) There are hundreds of used books on woodworking on Amazon. Order some on basic tools and woodworking. You’ll need to learn to tune up saws and other tools, and books are how I learned to do these things. It wasn’t until I tuned up my saws that good results began to happen. My saws cut exactly 90 and 45, or any angle I need now. Two books I really love are Bill Hylton’s “Woodworking with the Router,” and “The Joint Book” by Terrie Noll. The Noll Book is a really concise and heavily illustrated reference with great hints for making every variety of joints. There are lots of good table saw guides. 3) I made some of my first projects with MDF and ordinary plywood before using more expensive material. Make the same project several times with improved skill, material and workmanship each time. Great learning method. These days I use Baltic Birch ply whenever possible. Cost a little more, but superior in every way. 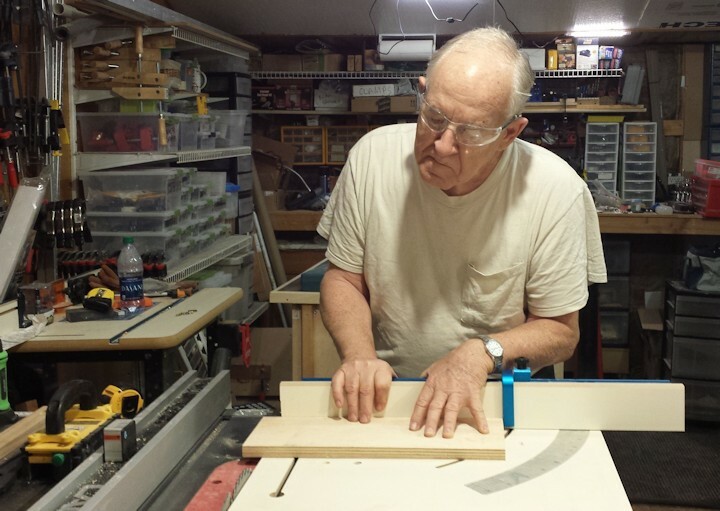 4) Consider making cabinets or stands for each of your power tools as first projects. My first cabinet was of MDF and my sander and all my sanding gear still sit on and in it. I can’t tell you how much confidence I got from building space efficient shop stands and now, all the tools in my smallish shop are on casters and easily moved around for use and cleanup. I put doors on every cabinet to reduce wandering dust and to master making face frames and doors. BTW, if you add casters, use two non swivels on the back and two locking casters on the front–make sure the lock secures both the wheel rotation and the swivel so your carts don’t skip around in use. My shop made stands also take up far less floor space than the spread-legged ones that come with many tools, which makes it far easier to move tools around in a compact shop–which is necessary to clean out the insidious sawdust. 5) Many of the woodworking supply stores in Canada and the US (and I imagine overseas) have demos on weekends. Attend and get to know the people you meet there. They can turn you on to sources of wood and you can get some nice help and begin a friendship or two. Don’t forget to talk with the employees as well. At our local Rockler, several of the employees are serious and experienced woodworkers and always eager to help. I’ve also found some of the big box stores employ a few very experienced wood workers, carpenters, electricians and plumbers. You just have to start a brief conversation, if they seem knowledgeable, ask them about what they did before they worked at the store, that will get the conversation flowing. 6) Among your first purchases should be some form of dust control. Many woods are proven carcinogens and can quickly, permanently damage your lungs. Dust collection information is on this site. I started with a 4-inch, home-made system to collect sawdust (see update below). I also have and recommend a dust mask with a small fan that pulls in pressurized air that not only keeps dust out, but also keeps my glasses from fogging. Got mine at Rockler and I keep a couple of sets of rechargeable AA batteries ready to use. UPDATE: After spending a LOT of money trying to make my own dust collection system work, I bought a 4 inch/100mm, 2hp unit from Harbor Freight, available for as little as $160 on sale, using a 25% off coupon. It collects the sawdust in a plastic bag which is easier and far less messy for disposal. I would have been money ahead to have bought it in the first place. There are many dust collection machines out there and I wouldn’t go the home-made route again. To enhance the system I turned a fiber barrel (from Uline) into a chip collector. There are many versions of this, but they are all placed before the DC blower. All sawdust and chips spin around in the barrel so the heavier material and loose screws and metal bits fall out. The barrel captures the largest share of sawdust and spares the blower blades. Look up Thein baffle on YouTube for details. For cutting just a piece or two, I keep surgical style disposable masks handy. I also built a box with 20×20 filter inside and a fan that pulls air through to remove fine airborne dust over time. You can even tape a filter to the back of a fan in a pinch, but WEN makes a nifty filter meant for this task, and the price is reasonable. Don’t take your mask off right after cutting or cleaning up because there is always dust floating around for awhile. If you start coughing, it means you need to pay very close attention to dust control and wearing a mask. It takes months to recover from a bout of working unprotected with MDF (Medium Density Fiberboard) without a mask. Chop and miter saws are usually the worst sawdust scattering offender in the shop. My solution was to use a clear plastic shower curtain that wraps around the saw and catches most of the sawdust that drops down into a collection box. Don’t force your cut on this kind of saw since that seems to make the scatter even worse. Pull the blade across the workpiece toward you for a shallow cut, then deepen the cut pushing the blade away. This channels most of the sawdust backwards into your collection system. I also use my dust collection system with a sweeper attachment to clean up the floor. It has one long, 4-inch flex hose that moves from tool to tool. My router fence has a 2.5 inch port behind the bit, on the fence. There is also a 4 inch port on the box that contains the router under the table. You can find an adapter that has a Y shape, one arm attaches to the 4 inch collector hose, the other connector goes to the fence port. It helps a lot. The problem with sawdust on the router table is that it can lift the workpiece up slightly as it builds up so your cuts will be off. You must sweep this stray sawdust away frequently, so keep a wide brush handy. Blowing sawdust away just launches it airborne so you wind up breathing it in. Fine sawdust stays in your lungs—a very bad thing! 7) Take your sweet time with projects, there’s no rush and it is easy to have a project nearly complete, then make a careless, quick cut or other error that ruins all your good work. In most cases, it is best to fit pieces by putting them in place and marking rather than just measuring and cutting. Cut a bit over and shave the piece down using a good block plane for an exact fit. A good block plane, nice and sharp, is a basic tool you’ll use more often than you’d imagine. 8) Buy the very best table saw you can manage. It will quickly become the most used tool in your shop. A little debt could move you up a notch and help you produce better results and cut thicker wood. Get the best tools you can afford and set them up as precisely as you can. You’ll find instructions in your used book collection or on YouTube. Read the reviews and ask questions on the forum before you choose. To me, it is worth it to use credit if necessary to move up the quality scale for the table saw. Bosch offers a small, construction type table saw that members here agree is head and shoulders above other saws in its class. If your shop or budget is a little tight, this saw gets good reviews from members, and I believe that you can get refurbished models that are truly like new from CPO tools. There are models called hybrid saws that have the mechanical works attached to the cabinet rather than the top, which is good. I replaced my old Delta contractor saw with a Laguna Fusion saw. My shop is not wired for 220, so I was happy with the 110volt, 1 3/4 hp motor. Many forum members have been very happy with less expensive models, Grizzly for example, but I prefer the Laguna for its amazingly flat table and extensions and its fit and finish (and reasonable price when on sale). Learn to set up and tune up your saws and tools (books and videos show you how) because you can’t make anything great if your tools are even slightly off. Many people prefer the Saw Stop because it all but eliminates the risk of cutting off a digit, but you’ll pay about twice the price of otherwise equal saws. Until you get a good table saw, you can get fair results using a circular saw and a straight edge. A home made straight edge is made by attaching a 1x straight edged board to a piece of hard particle type board (Masonite in the US). Run the saw along the 1x to cut off the excess and to form a perfectly straight edge. This will also reduce chipout or rough edges. The finished jig will be 250-300 mm wide (10-12 inches), by about 5 ft. long (150 cm). Not long ago I bought a Triton track saw that’s great for breaking down sheet plywood, but a decent table saw comes first in my book. The best safety device is paying very close attention to what you’re doing with a saw, but a close second on the table saw is a MicroJig Gripper, which lets you control wood on the saw while keeping your fingers safely away from the blade. There is a fancy and a simpler model, either of which is good. I have two to walk long pieces through my saw smoothly, but usually only need one. Band saw add on: Recently bought a Laguna 14/Twelve band saw primarily for resawing. It is a beauty and was on sale to boot. I keep a smaller 12 inch Rikon in the shop for minor cutoffs or curves. If you’re making furniture with heavier or shaped hardwood parts, a good, 14 inch or larger band saw is a must. My tools are divided between my shop/shed and garage. Garage tools are for wood prep; band saw, jointer, planer, dust collector and the track saw. In my shed, I have a 12 inch bench band saw distributed by WEN tools that is a a little cheaper, but identical to the Rikon. 9) If you can, get an electrician to add a 220 outlet or two to your shop. If you set up in the garage, you may be able to use the electrical outlet for the dryer. There are many tools that require 220 volts to work best, and many used 220 v tools are available at really good prices–if you feel comfortable buying used. Another tool source is to visit estate sales. Every once in awhile, you find tools no one else in the family desires or knows the value of, so you can get them cheap. If you don’t have a router yet, I have come to like the Triton TRA001, which is perfect for table use, particularly since you can adjust height quite precisely from the above the table with its built in lift. That feature really saves my knees. However, it is just too heavy for this old guy to control freehand. I really like the Bosch 1617 EVSPK for hand held use. There is a newer model that has a light and switch on the handle that costs more. Both come in a kit with fixed and plunge base. The 1617 can serve in a table just fine. Bosch has many accessories available that are very well made. Others like different brands, but Mike recently checked in on the topic and compared a variety of brands and the Bosch came out ahead. I prefer the raising and lowering mechanism on the Bosch with its precise micro adjustment knob. The Bosch fixed base can be used as a lift in a table. The books on routers and other topics are really useful for understanding some of the arcane woodworking terms associated with this must-have tool. As you get into making cabinets, at some point you may wish to get a smaller “trim” router, such as the Bosch Colt or DeWalt 611. These only use ¼ inch shaft bits, but they are very light and can handle light duty work. 10) When it comes to router bits, try to stick to the half inch (12mm) shafts with carbide cutting tips. These are astonishingly sharp. Bosch and Freud are easily available at HD or online, but there are lots of other excellent brands including the well liked Whiteside and Sommerfeld bits. Be careful of those ultra sharp carbide tips, which are fragile. I’d suggest storing them in one of those foam lined cases you can get pretty cheap from Harbor Freight, loosely packed so they don’t click together. A few of the cheap bits don’t have carbide tips. Spiral bits are sometimes used to cut grooves. Carbide spiral bits are both expensive and fragile and it takes very little abuse to ruin them. Many prefer high speed steel bits for that particular purpose. I buy bits as I need them and don’t much care for large kits. However, someone recently suggested getting a kit to start out with, then gradually replacing only the bits you actually use with top grade bits. This makes some sense to me, but stick to the half inch shafts if you can manage it–most kits I’ve seen have 1/4 inch shafts. I would avoid huge sets with odd bits you are unlikely ever to use. A few standard bits most of us have are the round over bits. You can get them in different sizes, but mostly you’re likely to use the quarter, half and ¾ sizes. Another bit that is very useful for cabinetry is the half inch rabbiting bit with a bearing. Some come with a changable bearing that allows you to change the depth of the rabbit. Doing fancier stuff makes those cash register numbers spin because door bit sets, for example, are pricey! I have settled in on Sommerfeld matched bit sets for doors and other multi-bit uses. Set the first bit in the set and you can change bits without readjusting router height. Watch Marc Sommerfeld’s videos on YouTube, they show superb router technique by a guy with years of cabinet making experience. I use his hint to drop a half inch grommet into your router collet so the bit height is consistent, but not bottomed out. I noticed that Freud now also markets matched bit sets. I suspect these are very good as well. One more thing about using bits, don’t try to take off too much wood in one pass. Make several passes taking a little more wood with each pass. Pay attention to the grain of the wood (that is covered in most books on routing) with a final pass just shaving and making for a very smooth finish. My personal rule is to cut no more than 1/8 th of an inch per pass. The larger the bit, the slower you should set the speed control. 11) The most useful item I own for my saws is a Wixey digital angle gauge, which allows me to set up all my saws to exact angles (eg: 90 degrees to the table). It wasn’t until I started being meticulous about this that my projects started working out right. These are about $30 on Amazon. I also have a Wixey digital height gauge on my planer—a real joy to use. 12) Pocket Hole jig and construction. Although there are many ways to make cabinets and face frames, I have found that pocket hole screws have really made making them easier. Just remember, coarse threads for soft woods, fine thread for hard woods, and I find the square head easier to drive correctly than the Phillips type. My Kreg pocket hole jig is mounted on a chunk of plywood that I can clamp down. The thing makes a lot of sawdust so dust collection is a good idea. I also find that with careful, exact 90 degree end cuts to the wood, the pocket hole approach produces absolutely square cabinets and face frames. You’ll want a couple of face clamps and a Kreg right angle clamp if you use pocket hole joinery on cases. There are many helpful videos on this jig and it is not very expensive as tools go. Most of us limit pocket holes to areas that don’t show. 13) Make a table saw sled (lots of YouTube videos on how to) for perfect 90 degree cuts on your table saw. I had a little more money than time, so I bought the sled Rockler makes that has a swinging fence and a very precise angle scale. I love that thing and set up a special shelf right next to my table saw to store it and keep it flat. Cross cuts on the sled are wonderfully exact and it prevents most tear out, the ragged or splintered area at the end of a cut. The sled is also a much safer way to cut short pieces as well. You set the sled to a precise 90 or 45 angle using a drafting square. Most saws come with a miter gauge, but I prefer one of the precision gauges. Many forum members like Incra’s gauge (me too). Precision is important with gauges. You will read a LOT about jigs here and in your books and videos. Jigs, accurate T squares, a good straightedge are all incredibly useful for producing good work. The more I venture into really good hard wood construction, the more I appreciate how jigs produce accurate results without wasting expensive wood through mis-cuts. Most of us make jigs as we need them, but one jig you will really love is a Table Saw Sled. Look up one of dozens of versions on YouTube. 14) I had a lot of problems with tear out at first, but most of that stopped when I started using a sacrificial backup block to push the last bit of a piece through the router or saw. I often use square pieces of MDF (medium density fiberboard) because it is cheap and stays flat. When it gets torn up, I just cut off a chunk and use what’s left. Really helps! You can do the same with any piece by putting a backer board behind where the cut goes–you cut through the piece first, the backer last. You may also want to use feather boards to hold boards in correct alignment to the fence and blade or bit. You can buy these or make your own. The commercial ones have the first “tooth” cut a little short to indicate how far the feather board should overlap the work piece. Zero Clearance Inserts for the table saw: On the table saw, buy or make blank inserts to make zero clearance inserts (see YouTube for how to do it). Basically they are solid and you raise the blade up through them so the opening is just the width of the blade. This really helps make great, tear-out free cuts. I also found that I wanted to push that last quarter inch through the bit too fast, now I feed the piece at a steady pace all through the cut. 15) Clamps: The joke is you can never have too many clamps. The ones I use most are about $3 each at Harbor Freight, about 9 inch F clamps (they look like an F). I have 18 of them. The same source has longer versions up to 24 inches and I keep 4 to 6 of the 18 and 24 inch models. I have four sets of two of 24 to 60 inch (Jet) parallel clamps for making really square cabinets and other items where holding things square for glue up is important. The better the quality of bar clamps, the thicker and stronger the bar will be. I’ve all but given up on plastic clamps, but have a few that look like scissors for lightly holding things together or down. Depending on what you’re making, a few wooden hand screw clamps could be useful, including holding small parts for safer routing. I recently added a couple of special steel C clamps that have a 12 inch open throat. Very handy item! Not long ago, I found Bessy clamps in sets of 4 for $20 to $30 at big box stores. I prefer using the Bessy clamps because they have heavier bars. 16) Hand planes and hand tools: Learning to use these is something of an art, as is proper sharpening and setting of their blades. There are lots of woodworkers who really love working with hand tools, most will suggest you buy used and clean and tune them up–which is actually quite fun. I prefer just to buy new and really like the Wood River V3 brand for its quality and acceptable price. Rob Cosman has videos online about planes, their preparation, care and uses. Another hand tool purest worth watching is Paul Sellers. Chisels are important particularly if you are making furniture. Sharpening chisels is a basic skill involving many ultra fine grits of sandpaper, ultra flat surfaces, maybe diamond grit sharpening stones—arcane stuff, but anything less than a razor sharp chisel is pretty useless. Don’t scrimp on chisels, cheap ones get dull fast. Look up “Scarey Sharp” methods on YouTube, it takes patience but not much money to work sharp. I recently bought a diamond sharpening device with diamond dust imbedded in a nickel steel plate. It has small cut out ovals so the metal grit doesn’t clog the diamond surface. Use these sparingly and use one of the specialty diamond sharpening lubricants with it. I use this for quick sharpening touch ups, just 4-5 strokes will do. It’s a little easier to use than the sand paper method, which I save for major sharpening tasks. The most important thing is to flatten the back of the first inch or so of the chisel. Unless that is flat, you can’t sharpen a chisel or plane blade (iron) accurately. You do this only once. The one plane every shop should have is a small, low angle block plane. These have so many uses that’s it is hard to list them all, but they are really great for trimming up ends of workpieces, quickly rounding over edges without having to set up a router, fine fitting the length of a board. New ones can be had in decent quality for about $100 and up. Nearly all planes require being tuned up before they are any good. You can look this process up on YouTube. Cheap block planes are passable if you really work them over first, but most won’t hold an edge very well and some are not milled accurately and will never cut right. There are dozens of different kinds of planes, but for anything serious you should have a #4 1/2. which will do a lot of different tasks fairly well. I personally really enjoy using planes and have at least seven for various special uses. Misc. tool stuff. Once you start using hard and expensive woods, you’ll probably want to add three other shop tools. A drill press, jointer and planer. The drill press allows drilling perfectly vertical holes and can help you produce mortise and tennon joints. A good bench model will set you back a couple of hundred bucks. The Jointer lets you cut a perfectly flat surface on your wood. The planer lets you use that flat surface and cut a perfectly parallel flat surface on the other side. You can get a “lunchbox” style planer, but a really good jointer (at least 6 inches wide), is quite expensive. The benchtop models of jointers are mostly pretty limited. The floor models are very heavy, solid steel and a machined table that’s quite long. But these tools let you leave the big box stores warped, cracked, bowed and twisted dimensional lumber behind. Look up these tools on YouTube to learn more. 17) If you have a dedicated shop space, take the time and trouble to insulate it. You will enjoy working in it much more if you’re not roasting or freezing. I installed a middle sized window AC unit through a shop shed wall for relief from our desert summer and it is now even more of a pleasure to be out there. Insulation also holds in heat during winter. A couple of heaters bring the temp up, but just one keeps it comfortable after that. Cold fingers are clumsy, not good around spinning blades! I recently had the garage shop insulated and dry walled. Much nicer to work in there these days. Woodworking is not necessarily a cheap hobby. Wood can be costly, so are decent tools, And there’s hardware, stuff for jigs, dust collection and on and on as you get going. My good wood supplier is 60 miles away, so I often work in decent local pine and plywood with as many layers as I can find. I found some decent plywood at HD. Before long you will hear how superior Baltic Birch is to the best of HD ply, but you have to ferret out a decent source. Chinese made birch ply is generally no match for the real stuff, which, when you cut it shows no voids inside. To me the 60 miles is a small price to pay to work with Baltic Birch ply and beautiful hard woods. This has run pretty long, but I think the information is helpful for someone new to the hobby. The suggestions represent a LOT of trial and error. And yes, you can spend a lot getting set up, but most of us built up our shop and tools over time, more than a decade for me. Beside that, my wife likes me being around, but busy out in the shop. Thanks for the insight. To me the simple and true tip to take your time rings true and to the point. A trait I lacked before retirement, mostly because I never had the time to do that, now I know why most fine craftsman have paid a lot of dues, experience can never be taught only obtained over time. Thanks for this. I am just getting started in woodworking and the few things I have built so far don’t seem to have the accuracy and precision that I want, or what I see in things others have built.